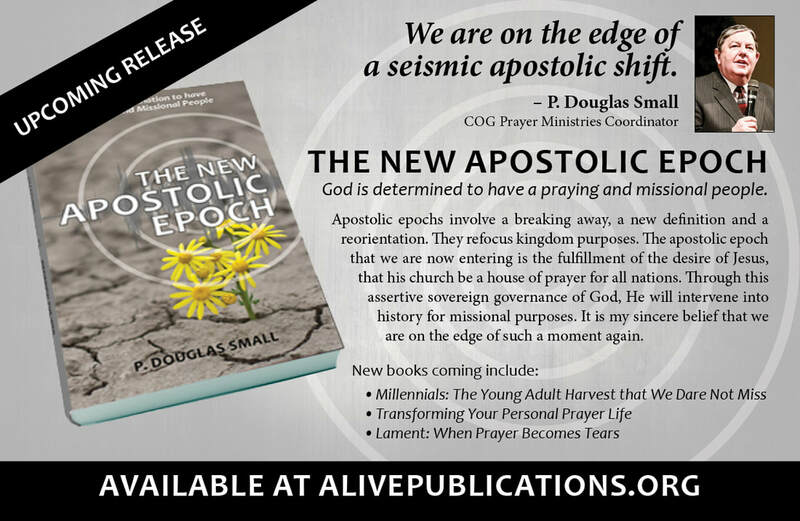 "Review of The New Apostolic Epoch by S. Douglas Small"
This Manifesto is a true clarion call to the Body of Christ! It is sounding forth with a true Apostolic tone that resonants through both spirit and flesh. Dr. Small's insights and nature are clear indications that this manifesto is Spirit birthed and Spirit breathed. Our resolve therefore should be, to be a people of humility and dedication to the very thing for which we have be called. It is the underlining theme of this work and carries with it the very heart of Father God. Truth has become quite clouded in many Christian churches today. I know that no one group has a monopoly on absolute truth. Most Christian groups have their preferred doctrines, many of which are highly suspect and, in some cases, unscriptural. Jesus’ words clearly state the only reliable truth: “I am the way, the truth, and the life. No one comes to the Father except through me.” (John 14:6) As for the requirements for salvation, again the Word is very clear: “Sirs, what must I do to be saved?” And they said, “Believe in the Lord Jesus, and you shall be saved, you and your household.”” (Acts 16:30-31) There is not another name by which we can be saved, but that of Jesus - Yeshua the Messiah. No organization, no denomination, no one but Him! to the prayer offered in this place” (2 Chronicles 7:14-15). we must take counsel with heaven and move with clarity and discernment. Do we accurately carry the Name of GOD? Are we praying prayers that touch heaven? Are we posturing in true humility and submission to Holy Spirit? Are we seeking God’s face and the glory of His majesty, or just His hand of provision? Do we really have a repentant heart and follow through with our conduct, or simply go through the motion of “continually repenting” with no change of course? Why do we continually speak of “our healing the land”? When it is only Almighty God that can do this deep work! These are just a few of the questions that are raised as we walk through 2 Chronicles 7:14.
read the WORD with understanding. Please look it up in the TANACH (Hebrew translation of scripture), the Interlinear Bible, NASB, even the Message Bible . out the rich treasures within GOD’S WORD! in which you alone are sovereign. We trust in you alone LORD to accomplish your will in us and through us. The information below is not of my concerns alone, but these points were shared over 100 years ago by a prominent Bible theologian and scholar Clarence Larkin. It was at this time of “enlightenment” that many christian sects and groups were forming. Larkin warned the Church at that time of these false doctrines slipping into mainstream Christianity and what the outcome would be; We see it today ! So, beloved we must know not only our identity in Christ, but our identity as the “ekklesia” lest we be deceived into what Larkin warned would be the final outcome, an apostate church thinking it was “preparing the world for the kingdom”, yet they were actually in partnership with the world serving the purposes of the antichrist in the last days. The church, which began in Acts 2, exists for three specific, divinely ordained reasons. First, the church exists to glorify God. Second, the church exists to edify or build up members. God has placed spiritual gifts in the body of Christ for the purpose of our being built up, so to become spiritually mature, and reach unity. Third, the church exists for the purpose of accomplishing world evangelism and to fulfill the Great Commission. So your views as the true purpose of the church and your understanding of what the first century followers of Jesus Christ believed they were called out to do will affect the way you walk out your faith and assignments in the Lord. As in years past and becoming manifest again today some are promoting an understanding that does not express the truth about the true purpose and nature of the ekklesia and its connection to the Messianic kingdom. One of these movements is the “kingdom now dominion theology," this teaching significantly alters the divine design for the church. This view opens the door not only to deception, but becomes a major distractions to the true gospel message of the first century and our Lord Jesus Christ being preached. Seeing the church as the kingdom also causes the church to substitute social causes for the preaching of the true gospel. The gospel becomes eclipsed by humanitarian concerns, then our priorities become out of order. The gospel should move us to charitable acts, but it should not be allowed to distract us from our true purpose and calling. One final thought on this, our understanding as to Israel’s position and purpose in the last days is also essential to our knowing our purpose of being the “called out ones”. The church has never replaced Israel in His eternal purposes! Jesus Christ - Yeshua is called the King of Israel, not the King of the church. He was declared the King of the Jews and will reign on the throne of King David on earth during the Messianic kingdom for 1000 years. ( John 1:19; 12:13 ; Matthew 27:11, 27, 37, 42 ) The Eternal Kingdom is a different separate kingdom in purpose and scope which we will discuss later. Remember precision in terms is very important to interpretation and application in context of scripture. As a “called out one” what was the first century believer’s concept of the church’s purpose, function and role in the earth? To be a witness of the Gospel into the whole world, by preaching, teaching and making disciples of Jesus Christ. Who was the leader or Lord of first century believers, both believing Jew and Gentile? They looked to one leader as their Lord Jesus Christ, they looked at his disciples as teachers of the gospel to build up and edify the body. What had He called them out to do? Matthew 28:18-20, and they were to become ambassadors of the gospel or ambassadors for Christ; to act as a representative of Christ preaching the gospel of Christ. ( 2 Corinthians 5:17-20; Ephesians 6:20) They were to witness or testify about Him and how God had opened the door to salvation to not only the Jews, but also to the Gentiles. confused with the hierarchal arrangement of the Catholic Church. Messianic Kingdom? Initially Jesus disciples thought he would set up His earthly kingdom at that time, however, the Lord corrected their understanding and gave them the assignment of being no part of this world, but fight the good fight of the faith, preaching, teaching, and be at the work of evangelism until He returns. On “That DAY” they will sit with him in His kingdom. The Messianic Kingdom is a literal earthly kingdom that will be established in Jerusalem when Jesus the Messiah returns and He will sit on the throne of David as He is the King of Israel. 1. What is the true purpose for the ekklesia? 2. What did the first century believers feel was their divine commission? 3. What were Jesus’ specific instructions to His followers? 4. What is the gospel? 5. How does our view of the Messianic Kingdom affect our understanding our assignment as the ekklesia? Today we will be considering specific questions as regards “ecclesiology”, the doctrine of the church. This is one of those foundational subjects we must know as we understand our Identity as The Church. Please don’t go by preconceived concepts or doctrines, let’s “Look Anew” at what the Word of God is teaching us through Holy Spirit, as we reason from the scriptures to receive God's thoughts on every matter. Allow Holy Spirit to speak to you in both asking and answering needed questions for the Body of Christ during this season of great deception and apostasy even within main stream churches and “Christian” movements. We are examining all things in light of the scriptures in order to clear up any misleading or false concepts being released by so many voices of well known leaders today. It has been stated; “one’s eschatology will affect his ecclesiology ". May we be clear in our understanding of our Identity as the Church, so it leads us to an accurate knowledge of the end times and eschatology. As we are considering the foundational understanding of who and what we are as His called out ones. We will be also examining the Kingdom of God, the Kingdom of Heaven, the Messianic Kingdom, and many aspected related to God’s purposes in the earth and heaven. We will understand the importance of using precise terms, as some confusion has come in using similar terms or references when they have difference in meaning or purpose. Thus, this can lead to error in interpretation or application. Our God is a God of order and not confusion, so let us rightfully divide the WORD. “The roots of the word ecclesiology come from the Greek ἐκκλησία, ekklēsia (Latin: ecclesia) meaning "congregation, church"[notes 1] and -λογία, -logia, meaning "words", "knowledge", or "logic", a combining term used in the names of sciences or bodies of knowledge. What does the word ekklesia mean? The word does not connote any special power or authority. It basically and simply means “called out ones”, indicating purpose. ​“Ecclesia (or Ekklesia) in Christian theology means both: a particular body of faithful people, and the whole body of the faithful. Latin ecclesia, from Greek ekklesia had an original meaning of "assembly, congregation, council", literally “convocation”. This is the PRECISE MEANING. Textually what does it most often indicate? Most often it pertains to either a Jewish and Christian group of individuals called out with a purpose of assembly, congregation, council", literally “convocation” for religious or sacred purposes. How has it been translated in modern Bibles? It is often translated as “church” however, this is not to imply a building were individuals were to meet. As early believers met in synagogues and personal homes. The word indicating a synagogue - (the meeting or the place) is Strong’s # G4864. As a “called out one” what was the first century believer’s concept of the church’s purpose, function and role in the earth? Who was the leader or Lord of first century believers, both Jew and Gentile? What had He called them out to do? What form governance was in place for the early church body? Or was there one? Did the first century church indicate in anyway they were to take dominion or authority over the governments of the earth before Christ’s return to setup His Messianic Kingdom? PLEASE USE REFERENCE MATERIAL AND SCRIPTURES AS OUR GOAL IS TO HAVE SOUND BIBLICAL UNDERSTANDING AND PRAY WITH ACCURATE KNOWLEDGE OF THE WORD OF TRUTH. Wisdom Key: Always use several translations of the Bible in your study as well as Bible Dictionaries, Lexicons and Strong’s Concordance. Not all Bibles are translations, many new versions are paraphrases and not very accurate for study purposes. Some have been textually changed to met the author’s viewpoint or particular doctrine. Over the next few weeks we are going to be unveiling the deep truths found in God’s Word as it relates to His “Called Out ones” the Church of the Firstborn. During this time of deep study and mediation on God’s Word ask Holy Spirit to give you wisdom and discernment into the deep things of God. Many today use terms that they are unfamiliar with, or are misinformed on, or perhaps even misguided in their understanding of. This term” ekklesia” is being used across many denominational lines, as well as in varies movements within “Christian” circles. It would be wisdom on our part to know exactly what God’s Word has to say on the matter if we are to fully comprehend our identity as The Church in God’s eternal plan of salvation and restoration of all things in Christ Jesus. As we cover the points below on our prayer calls over the next few weeks, please incorporate the scriptures cited to give clarity and insights to what Father God is teaching us as His “called out ones “ for a special purpose. Take bite size portions and chew on them. Release the meat of the Word into your spirits and let it fill you with faith as Father God unfolds these revelations. The above scripture indicated the depth of Father’s God eternal plan and high-lites His multi-dimensional household, made up of varies groups of which we are a part of. This material will call for focus, prayer, and great discernment as your faith meets with God’s faith in the unfolding revelation of Divine mysteries from the pages of His written Word and Holy Spirit. Each week we will be considering specific questions as regards the material below. Please do not just go with previous concepts or doctrines you may had heard, let’s “Look Anew” at what the Word of God is teaching us through Holy Spirit. You will may find there are doctrines or concepts you have known in the past, things that have been changed in order to mislead or deceive, or you may just find a refreshed understanding that will give you greater insights as to your calling. Allow Holy Spirit to speak to you in both asking and answering needed questions for the Body of Christ during this season of refinement. 1. What does the word ekklesia mean? 2. Textually what does it most often indicate? 3. How many times is ekklesia used in the Greek text? 4. How has it been translated in modern Bibles? Ecclesia (or Ekklesia) in Christian theology means both: a particular body of faithful people, and the whole body of the faithful. Latin ecclesia, from Greek ekklesia had an original meaning of "assembly, congregation, council", literally "convocation". ἐκκλησία ekklēsía, ek-klay-see'-ah; from a compound of G1537 and a derivative of G2564; a calling out, i.e. (concretely) a popular meeting, especially a religious congregation (Jewish synagogue, or Christian community of members on earth or saints in heaven or both):—assembly, church. 1. among the Greeks from Thucydides (cf. Herodotus 3, 142) down, an assembly of the people convened at the public place of council for the purpose of deliberating: Acts 19:39. 2. in the Sept. often equivalent to ÷ÈäÈì, the assembly of the Israelites, Judges 21:8; 1 Chronicles 29:1, etc., especially when gathered for sacred purposes, Deuteronomy 31:30 (Deuteronomy 32:1); Joshua 8:35 (Joshua 9:8), etc. ; in the N. T. thus in Acts 7:38; Hebrews 2:12. 3. any gathering or throng of men assembled by chance or tumultuously: Acts 19:32, 41.
a. an assembly of Christians gathered for worship: ἐν ἐκκλησία, in the religious meeting, 1 Corinthians 14:19, 35; ἐν ταῖς ἐκκλησίαις, 1 Corinthians 14:34;συνέρχεσθαι ἐν ἐκκλησία, 1 Corinthians 11:18; cf. Winers Grammar, § 50, 4a. a. a festal gathering of the whole people to celebrate public games or other solemnities. *Above reference are from:THAYER’S GREEK LEXICON, Electronic Database. Keys of Wisdom - Are You Messianic? This may shatter some scared cows - religious ideologues and “Christian” mindsets! The Jewish/Gentile Church was grafted into Israel, not Israel into the Church! The Messianic Kingdom is a reality for both Jew and Gentile, this is the ONE NEW MAN. The first century congregations were made up of both Jewish and Gentile BELIEVERS, most often called or referred to as Saints. They all confessed to be Believers in Yeshua as Christ, the Jewish King and Messiah. Note that Jesus is the Greek form for the Hebrew name Yeshua, and Christ literally means Anointed One. We are called to be the “Household of God” united under the “New Covenant” as well as the Abrahamic Covenant. Who are the parties of that new covenant? Jeremiah 31:31-34 reveals the answer to this question, and it is confirmed again in Hebrews chapters 8 and 9. It is the LORD of Host who makes covenant with the House of Israel and the House of Judah. SEEK out WISDOM and understanding… Read the whole book of Hebrews. Father God is calling you to return home, not as a bondservant, but as a son. Father Abraham is gathering His children for the blessings of all the nations. (Genesis 17:1-5, 48:19) Repent from rejecting your Jewish Messiah and forsaking the House of Israel! Repent from replacement theology in all it’s forms! Come back to the Father’s House, this is the true revelation of the “fullness of the gentiles," as gentile believers return to their covenant roots, not as jews, but as sharers in the “Household of God”. This is the revelation of Malachi 4:4-6; we are the children of Father Abraham, we both Jew and Gentile are coming home. Do you hear the call of the spirit of Elijah now at work within you, as we the sons now return to the fathers? This point is clear; the Church* has not been called to become Jewish, nor are the Jews called to become “Christians”. HOWEVER, both the Jews, which is all of Israel, and the spiritual community or congregation of both Gentile and Jewish Believers, which has been called the “Church”, are clearly CALLED to be MESSIANIC, AS ONE IN MESSIAH. They have trusted in the God of Israel and his son Yeshua as Messiah…. Catch the depths of that revelation!!! I believe and receive Jesus Christ as Yeshua the Messiah King of Israel. He is more than my Savior, Deliverer, and Redeemer, He is my Lord and King. I am confident that He will soon return and establish His Messianic Kingdom as foretold in the scriptures, and He will establish his millennial region out of Zion. Therefore, I would say I am Messianic and Heir to the Kingdom. How about you? *Note that the word “Church” refers to a building or religious institution as defined by Websters Dictionary. It is not found in the original greek texts of the New Testament. The greek word “kuriakos” #G2960 which means “pertaining to the lord”, was the root word that eventually birthed the concept of “church’, and then developed by the Scots as “kirk” into the understanding of a building or religious institution around the 1300 AD. (1 Cor. 11:20, Rev. 1:10 ) However, the Scriptures never use this word or ekklesia to describe a building or place of worship. The greek word often translated “church” is “ekklesia” which means the congregation or assembly of; Strongs #G1577, derivative of #G2564; kaleo which means to call, as in call out. Hebrew word is qahal #H6951, from #H6950, an assembly, congregation. See examples in Psalm 22:22 and Hebrews 2:12. Read these informative articles for further clarification as you do your own research. A VERY significant sign happening RIGHT NOW....Mars is in Sagittarius....It’s a sign in the heavens that a Great War is coming to the earth...ARE you prepared? This was revealed to me as I sat out under the stars by the campfire in north GA mountains over the Labor Day weekend. Torah does not mean law, it means Divine Instruction! Pay attention, listen to what is being revealed in this scripture! Pray that the remnant will arise and declare the true WORD of the LORD. The faith of many will be shaken as their preconceived religious notions will be exposed as false. ...Jeremiah chapter 23, see cross references. Greek thinking and mindsets will be broken as the true Remnant align with Holy Spirit and the Jewish King Messiah, Israel moves into position to receive HER King, Yeshua Messiah and the nations are brought to the valley of decision. Clarification on the word "Complaisant"
I have had a lot of positive response to my last Blog. However, I did receive several questions on my spelling and use of the word “complaisant”. Some had never seen this word and felt I had mis-spelled complacent. As there are some unfamiliar with the difference, I am going to try my best to explain it for you. Since a clear understanding of the word will give you a better understanding of the message the LORD would have conveyed in my previous Blog. Getting the sense of the depth of the matter will open your eyes to Father’s heart, thereby moving you into a Kingdom perspective! Father spoke this clearly to me to use the word complaisant, as it conveys a powerful point …. The Father gave me this specific word...as it is very pointed in it’s meaning…. He was saying; We are too quick to just agree with prayers, ‘acquiesce in order to please’ and follow direction in “spiritless prayer lists”. Thus, without seeking Him first, we join in praying such spiritless dead prayers, never asking if this is really what He wants us to pray…Pleasing man and not Father God! Below you will find the definitions, see the contrast between it and complacent. willing to please others; obliging; agreeable: when unharnessed, Northern dogs are peaceful and complaisant. mid 17th century: French, from complaire ‘acquiesce in order to please’, from Latin complacere ‘to please’. showing smug or uncritical satisfaction with oneself or one's achievements: you can't afford to be complacent about security. mid 17th century (in the sense ‘pleasant’): from Latin complacent- ‘pleasing’, from the verb complacere. Complacent and complaisant are two words that are similar in pronunciation and that both come from the Latin verb complacere ‘to please,’ but in English do not mean the same thing. Complacent is the more common word and means ‘smug and self-satisfied’: after four consecutive championships, the team became complacent. Complaisant, on the other hand, means ‘willing to please’: the local people proved complaisant and cordial. So how do you pray? “Pray at all times with all prayer and petitions in the Spirit” with understanding, speaking back to God what we have heard Him speak to us in our hearts and minds and spirits. He will then answer the prayer that He Himself has inspired! The end result will be that He gets all the glory and all will know that He is God and there is no other!